It’s due to several reasons. 1. Connecting it in wrong connection mode. -> While holding down “U”, connect your keyboard. 2. Customized USB cable or improper USB hub. -> Try other USB cable when connecting it. Some customized cable has bad electric flow. -> Or connect it directly to the PC without USB hub. Some USB hub couldn’t supply enough electric power. While pressing Ctrl, plug your keyboard. At the bottom, press Upload firmware. Firmware is “ps2avrGB_NKRO.hex”, not the ones starting with “keymap_xxx”. 4. Wrong USB Drive Installed. If you install it properly, it looks like this. 6. If it doesn’t help, please visit this to test in-depth. 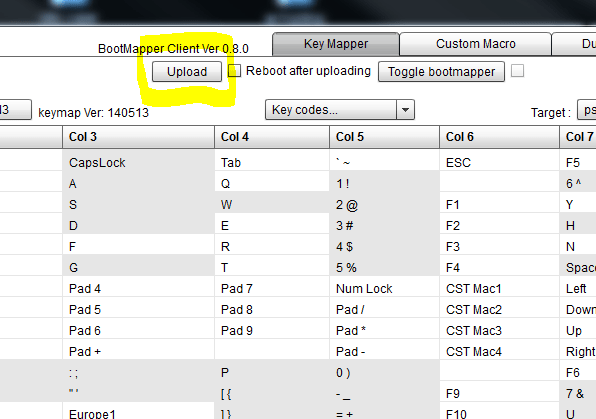 Sometimes a user upload a blank keymap file after opening BootMapperClient. 2) Select your keymap hex file. then press the button “upload”.